Minimalist German style with serious engineering and big audio, writ large in 4K. It's the BMW 7 Series of tellies! Luxury television brand, Loewe, has lifted the lid on its new range of Ultra HD TVs: the Reference. Surprise, surprise, it's a well engineered, modernist slab of televisual vorsprung durch technik. Setting its sights high, Loewe aims to create what it calls, 'a new reference point for TV performance and design'. We know this German brand's got the goods when it comes to the design side of things; fingers-crossed with the Reference it can nail the performance side too. Coming in 55-inch form to start with at a £3,800 price point, and 75 and 85-inch behemoths to follow, the Reference is a stylish, slimline TV sporting a crisp Ultra HD panel. As with other Loewe designs the Reference is also impressively customisable. It's been created to fit into your world rather than you into its. There are different stand options, for free-standing or sitting atop a media centre. The frame and stand can come in four different colours; glossy white, aluminium silver or black and 'Dark Gold'. There are also different colour options for the front of the integrated sound bar too. Loewe has also made the aural experience as important as the visual, with that sound bar packing a full eight speakers inside it. Using Loewe's own software the Reference can offer either virtual surround sound or act as the centerpiece for a discrete 5.1 setup. 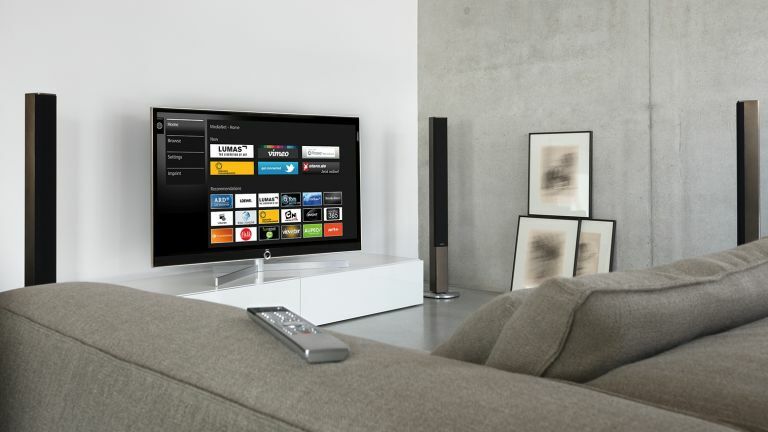 Where Loewe has fallen down in the past though is in the smart TV world, with its 4K Connect range not having the sort of far-reaching support the big name players can boast. With even Sony ditching proprietary software for the Android ecosystem it does seem a little anachronistic of Loewe to be stoically continuing with its own software. As a home hub though, supporting your networked home entertainment system, the Reference should fit in well. The 1TB hard drive with media server functionality and remote recording ought to make it a rather elegant solution.